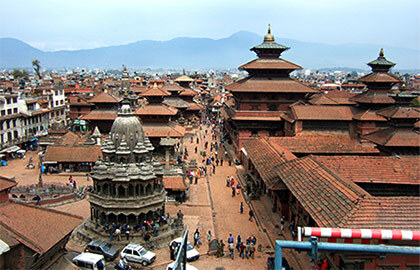 The travel tips in Nepal are suggestive measures to have a safe, comfortable and secure travelling experience within the country. 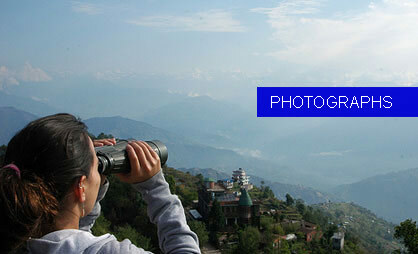 As Nepal is multifaceted in nature and appeal, it somewhat becomes difficult for a traveller to perceive. But in this case, the travel advisories are of great help as they introduce tourists to the beliefs, customs and prevalent norms of life in the country. 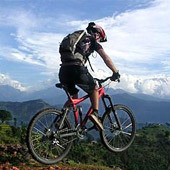 In short, they inform the visitors about Do’s and Don’ts of travelling in Nepal. Following are some tips and tricks that will help you great way while travelling in Nepal. Upon arriving at the immigration desk in the Tribhuvan International Airport (TIA), passengers without any dutiable goods can easily walk through the Green Channel for quick clearance without a baggage check. If you are carrying dutiable goods, you must proceed through the Red Channel. Apart from used personal belongings, tourists are allowed to bring to Nepal free of duty: cigarettes (200 sticks) or cigars (50 sticks), distilled liquor (one 1.15 liter bottle), and film (15 rolls). In addition to this, tourists can also bring in the following articles free of duty on a condition that you have to declare your belongings like binoculars, movie or video camera, still camera, laptop computer, and portable music system and take them out when you return back. There are taxi-drivers, travel agents and hoteliers waiting outside the airport terminal to offer their services to you. But tourists, especially women should make sure that the movements on roads are pre-booked with a reliable tour operator in Nepal for better and safe travel experience. Also, they should be alert about their belongings and not leave them behind inside the hired vehicle. Take off their shoes before entering a Nepalese home. Also, never leave the shoes or sandals upside down as it is considered inauspicious. Tourists can accept the handshake offered by either a male or a female. Never offer your hand first to a woman. Instead, offer a Namaste with folded palms as a traditional way of welcome. Nepalese men in general, Hindus in particular, avoid touching women and holy men. Although young boys and girls mix up these days, public display of attention is still inappropriate. Do not pinpoint or finger at a person or an idol/ image/ statue. Don’t sit in a direction with your feet pointing at people or at religious objects. While visiting a temple, it is customary to take of your shoes before entering a temple/ holy places. Walking or Circumambulation around the temples or stupas as per tradition is done clockwise. Avoid smoking inside scared and public places. Some Hindu temples in Nepal (Pashupatinath) are open only for Hindus. Photography is allowed outside Buddhist stupas and Hindu temples and during festivals. But when you are clicking people, always seek permission from them. It is a courteous way to ask for pictures inside temple, or during religious ceremonies, unless the action will be perceived wrongly. This code of conduct is also valid for photographing the usually shy Nepalese women who are not willing to be photographed. So seek their permission first. While travelling in Nepal or going out anywhere, it is preferable to dress decently, especially for women. It is always advised for women to wear comfortable and not too revealing clothes while travelling for safe travel experience. In short, avoid wearing shorts, bare shoulders and back and low necks in Nepal. Nepalese Rupee is the currency of Nepal. Each rupee is divided into 100 paisa and the prevalent bank notes come in denomination of Rs. 1, 2, 5, 10, 20, 50, 100, 500 and 1,000. The coins come in the variants of 10, 25 and 50 paisa and 1, 2, 5 and 10-rupee denomination. For foreign tourists, it is always suggested to exchange the foreign currency with the authorized banks, hotels and licensed money changers to derive maximum value for your money. Also, obtain and retain the encashment receipts of the transactions. The India Rupee, US Dollar, Euro, Canadian Dollar, Pound Sterling, Swiss Franc, Japanese Yen and Chinese Yuan are widely accepted in the banks of Nepal. NOTE – Travellers from India should not bring bigger currency notes like Rs. 500 and Rs. 1000 for they will not be exchanged in Nepal. It is always suggested to bring the multiples of Rs. 100 for comfortable exchange. 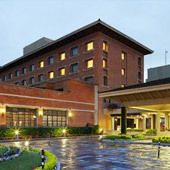 Major hotels, restaurants and curio shops accept the globally accepted credit cards like AMERICAN EXPRESS, VISA and MASTER CARD. You can contact the banks for credit card and services before departing from your home country. Also, there are ATM counters in Kathmandu, Pokhara and other big cities of the country that can be utilized for instant money transfers in the country. Most Nepalese eat their meal by hand for it not only feeds the body but also mind and spirit. All Nepalis love to eat dal, bhat and tarkari. Rice has been frequently eaten in Nepal and is also the staple food. While eating, it is always suggested to not to leave any leftovers and not even share the food from your plate. 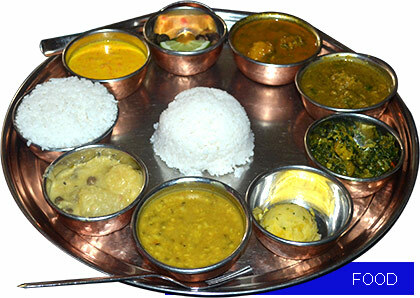 As per the local beliefs, the food once eaten from the plate is considered impure and called jhuto in Nepali. After the meal, Nepalese rinse their hands and mouths thoroughly and it is a prevalent practice in the country. Hindus and Buddhists don’t eat beef (cow’s meat), although restaurants and hotels serve beef to the tourists. If a service charge is attached to your bill in restaurant or hotel, don’t offer tip. But while subscribing to the services of porters, travel and trekking guides, and drivers when covering long distances, giving a tip is customary. For shopping, it is always suggested to buy the authentic and quality based souvenirs of Nepal from authorized stores and shopping malls. This is done to protect from being cheated with inferior quality products. Many exclusive showrooms at Durbar Marg, Asan and Thamel in Kathmandu specialize in offering exclusive Nepali handicraft, gems, jewellery and pashmina items at fair prices. Local handicraft items are good buys in Pokhara, Chitwan and Lumbini. NOTE – While purchasing antique items, enquire about its creation and past. If it is more than 100 years old, then it is an illegal crime and you might experience problems later at the Customs department. To ensure smooth clearance at the Customs department (Airport), please keep the receipts intact. SIM cards can be purchased at Kathmandu airport on arrival or at Ncell offices across the country for connectivity. The country code for Nepal is +977 and the area code for Kathmandu is 01, for Pokhara 061, Chitwan 056 and Lumbini 071. Don’t give sweets and money to beggars and children. Prefer to donate in to a school monastery or hospital. It is safe to take a walk around from morning till late in the evening, until the shops are open. Don’t step out in dark or in lonely areas. Keep an alert eye for the safety of your handbag, back-pack and items such as cameras. Since trekking is one of the signature experiences of Nepal, it is suggested to experience a trekking tour in the country of mountains. However, the precaution must be exercised in doing so. Don’t go up too high altitudes on mountain areas starting from 2500 meters upwards. 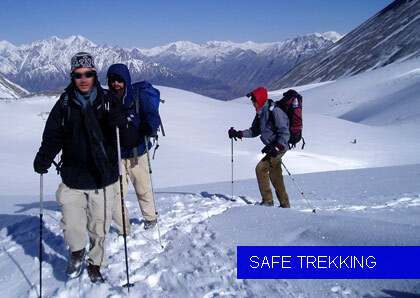 Always acclimatize your body to the extreme weather conditions during trekking. If you experience the initial symptoms like shortness of breath, nausea, headaches, fatigue, inability to sleep, loss of appetite and swelling, descend to lower elevation immediately and seek medical help. Helicopter rescue service is available at extra cost. Comprehensive travel insurance is of great help if you are taking a trekking tour in Nepal which will cover emergencies like helicopter rescue and medical treatment in the event of the accident on the trail. 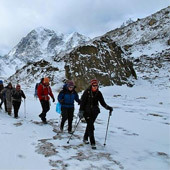 Travel in groups while trekking. Trekking with a guide from a registered agency is the greatest security. Drink water that has been boiled or iodized only. Always wash your hands before eating. Do not eat unpeeled fruit or vegetables unless washed thoroughly. Villagers might offer attention, for they are not used to seeing visitors from abroad. So don’t mind if you are being stared at. Just smile and enjoy being the center of attention. Do not litter the trail with trash and be a responsible tourist. Always trek responsibly and pack the disposable litter like bottles, tins, plastics, foil, batteries, to be thrown at the nearest disposal site. Likewise sanitary napkins and tampons should be properly disposed.